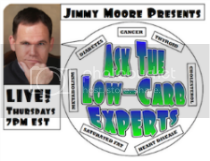 British physician and low-carb health advocate Dr. John Briffa is the final returning interview guest as one of the best of the best of 2012 for "Encore Week" 2013 today in Episode 639 of The Livin’ La Vida Low-Carb Show with Jimmy Moore! We started off “Encore Week” 2013 and hit the ground running on Monday featuring an interview with Dr. Thomas Dayspring sharing about what matters most with your cholesterol test results. We've got lots more to share with you all this week in these BRAND NEW EPISODES featuring your favorite podcast guests of 2012 as voted on by you. Don't miss Dr. Terry Wahls, Professor Timothy Noakes and Dr. John Briffa coming up later this week. Today we continue with the best of the best interview guests from last year with a well-spoken and extremely knowledgeable nutritional science researcher and author named Jonathan Bailor. He's the author of the outstanding book investigating what the most current data shows regarding weight loss entitled The Smarter Science Of Slim as well as the co-host of a superb accompanying iTunes podcast with Carrie Brown. Jonathan brings an educated, common sense approach to the question of diet and exercise that bucks the conventional wisdom trend of obsessing over calories. Listen in as Jimmy catches up with Jonathan about the new educational videos a la "Schoolhouse Rock" that he hopes will penetrate the proper nutrition and fitness messages into the mainstream, countering the accepted beliefs regarding weight loss and more. Tune in today and don't miss all of the “Encore Week” 2013 airing daily this week.